Way back in 1997, Liar Liar was an epic blockbuster by the standards of the day. The film earned $181.4 million, making it the number three film of the year. The only titles that offered stronger domestic performances were Men in Black and The Lost World: Jurassic Park. Liar Liar's box office inflation adjusts to $281.4 million, meaning that in 2008 dollars, it would be the #4 performer of the year behind The Dark Knight, Iron Man and Indiana Jones and The Kingdom of the Crystal Skull. Given this context, you should easily understand why I am so bullish on the prospects of Yes Man, a de facto sequel. 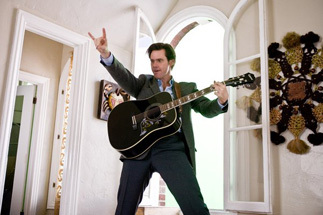 Since most Jim Carrey sequels don't star Jim Carrey (Evan Almighty, Son of the Mask, Dumb and Dumberer: When Harry Met Lloyd), this is a rare opportunity for instant box office credibility. The concern is that Carrey's career has been scattershot in recent years. The Number 23 was a disaster and Lemony Snicket: A Series of Unfortunate Events was a disappointment relative to expectations. We have to go back five years to find the last Carrey film that was a monster hit, but I still feel that the holiday season is a time for comedy. This was perhaps best demonstrated recently by the $250.8 million success of Night at the Museum. I don't think Yes Man is going to match that type of box office, but I do believe that this is a $150 million earner. In a pretty lousy December, that should be good enough for first place.